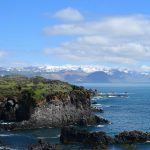 We hadn’t done a driving holiday yet (though we had been to Pune in the car), so we were on the lookout for an opportune time and a destination. The time appeared in form of Gandhi Jayanti on a Tuesday – the last long weekend of the year. 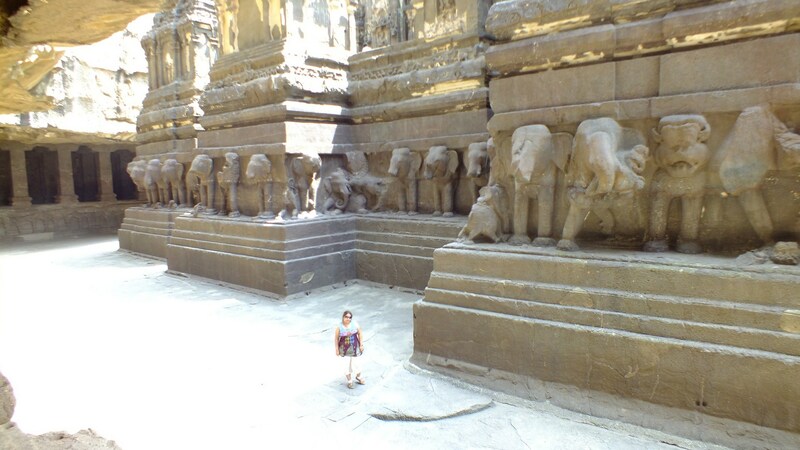 And for a while I had been itching to visit Aurangabad – to see the Ajanta and Ellora caves. They are supposed to be one of India’s foremost historical treasures, among India’s first World Heritage sites, and so close to Bombay. I had never seen them – the wife had seen them as a kid a long time ago. Aurangabad is 365 km from Bombay, but there is no direct highway to it. Preliminary searches suggested taking the NH3 via Nasik was better than the NH222 via Malshej Ghat. And by the results from Google searches, it seemed like not too many people from Bombay took the road route to Ajanta Ellora – maybe they preferred the trains (there is a Shatabdi to Aurangabad). 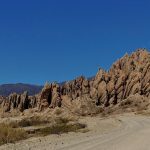 Travel websites like www.bcmtouring.com had a few travelogues which confirmed for us that this was a doable drive for one person. We were toying with the idea of asking someone else to join us, but then decided to keep it just for the two of us. Initially planned to be a 4 day weekend, we had to cut short the trip by one day because something came up on Saturday. So on a Sunday morning, at 6 am, we started our journey via the Eastern Express Highway from Mumbai. After clearing the tolls at Mulund and Thane, the NH3 till Nashik flows like a driver’s dream. Easily a better driver’s road than the Pune Expressway, the NH3 allows you to run up serious three digit speeds while making you work on the curves in the ghats. Absolutely exhilarating stuff. Pit stop was at Vithal Kamath’s a little distance before Igatpuri – good clean south Indian food we have become used to. For the onward journey, we made a slight deviation based on some reports that the Ghoti-Sinnar road wasn’t in the best of conditions. We decided to drive to Nasik and then turn south on NH50 to reach Sinnar. As it turns out, the deviation wasn’t required – there wasn’t much difference between the condition of NH 50 and the Ghoti-Sinnar road. But ofcourse, we got to drive on the NH3 all the way to Nasik, which was a beautiful beautiful drive. The road is 6-lane dual carriageway which widens into 8 lanes as we get closer to Nasik. 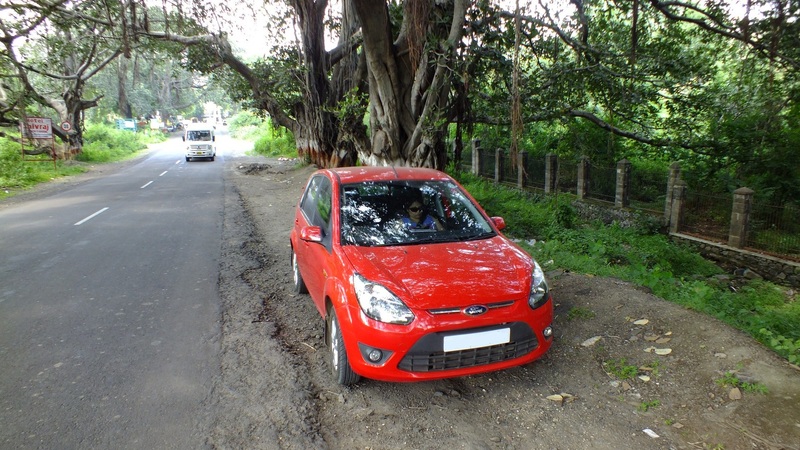 Once near Nasik, our effort to byepass the city and get directly to NH50 wasn’t much of a success as we found ourselves lost in small roads in Deolali, a military Cantonment. Nevertheless, with Google Maps and a few old-fashioned ask-the-locals, we were on our way to Sinnar. From Sinnar the road to Shirdi was quite good for the most part. Although only a two-lane single carriageway, it was fully paved and barring the odd slow tractor/jeep, speeds of 80 kmph could be maintained. 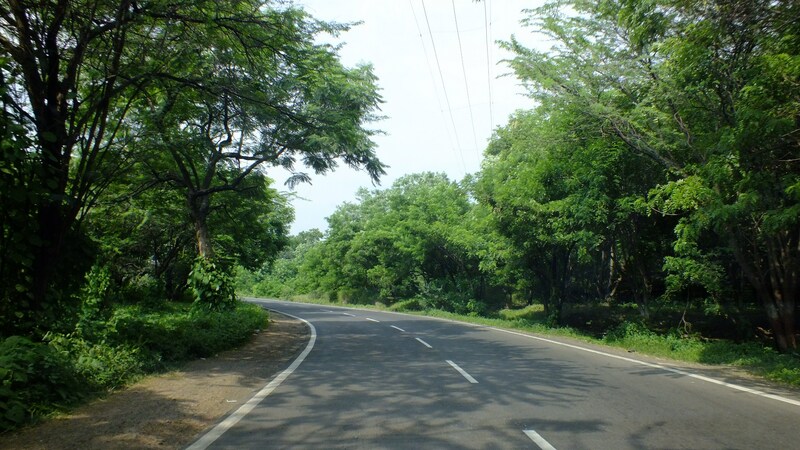 The road flows through agricultural fields all the way and is a delightful slice of rural Maharashtra. There is mainly Shirdi-bound passenger traffic on the road – do not remember seeing any commercial trucks on this road. The final stretch between Shirdi and Aurangabad is the weakest link. It is a rural road like the Sinnar-Shirdi road, but in broken condition. The last applied tar layer has weathered away in patches, leaving a forever juggling ride and punctuated with big potholes. Doing more than 50 kmph on this stretch is inviting a broken axle or a puncture. This last stretch took almost 2 hours and we reached our hotel in Aurangabad at around 1.30 pm. Including the half an hour breakfast and a 20 min chai break at Shirdi, it was about 6.5 hours of driving. 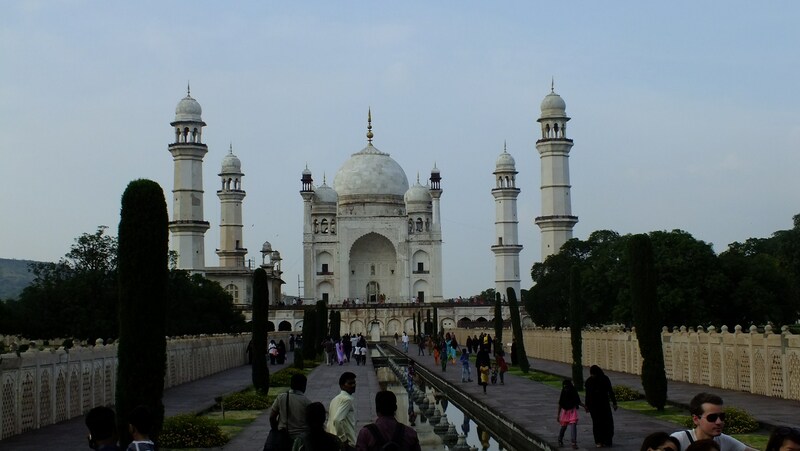 Aurangabad itself is a very prosperous city. We were pleasantly surprised to see wide clean roads, luxury vehicles and even a Deutsche Bank branch. We later spotted a Jaguar showroom (Mercedes and BMW showrooms are passé now) in the town as well. There is a wide range of hotels available – from the Taj Residency at the upper end to regular 600-a-night hotels. 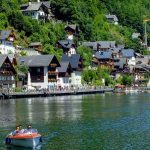 We went for The Manor hotel, which was situated in the town center, and had ample parking available. The hotel was a very positive surprise – the rooms and the fittings were at par with those at 5 star hotels – and it even had a 24×7 restaurant which served alcohol. It only had 4 floors and about 60 rooms in total. Extremely value for money for the 2500 per night we paid. After checking in and finishing a heavy lunch, we decided to cover Bibi ka Maqbara, a mausoleum built by Aurangzeb’s son for his mother (Aurangzeb’s wife). 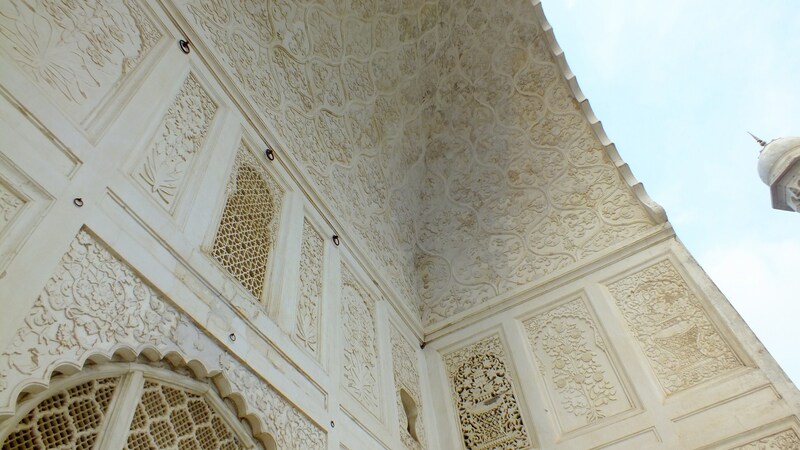 The Bibi ka Maqbara is an almost perfect copy of the Taj Mahal – except that it is made of regular stone and brick – and covered in white plaster. 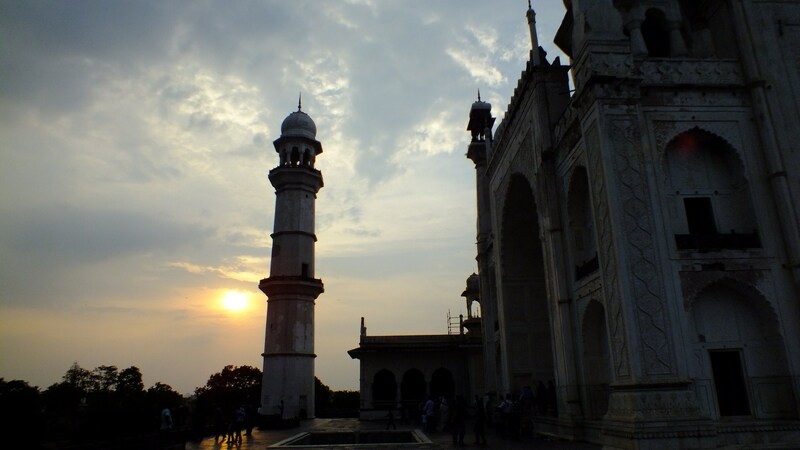 Even the gardens around the monument are set in the same pattern as that of the Taj – there is even a bench where you can take a photo with the Maqbara in the background. 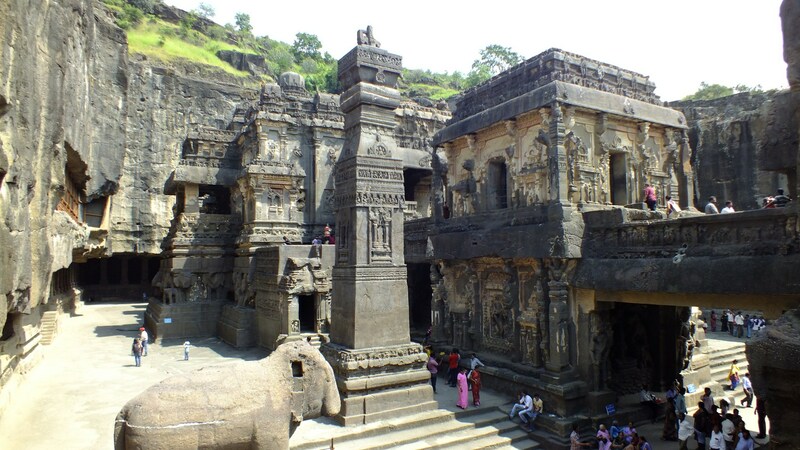 The Ellora caves are a bunch of caves carved into a rock face by Hindus, Buddhists and Jains. 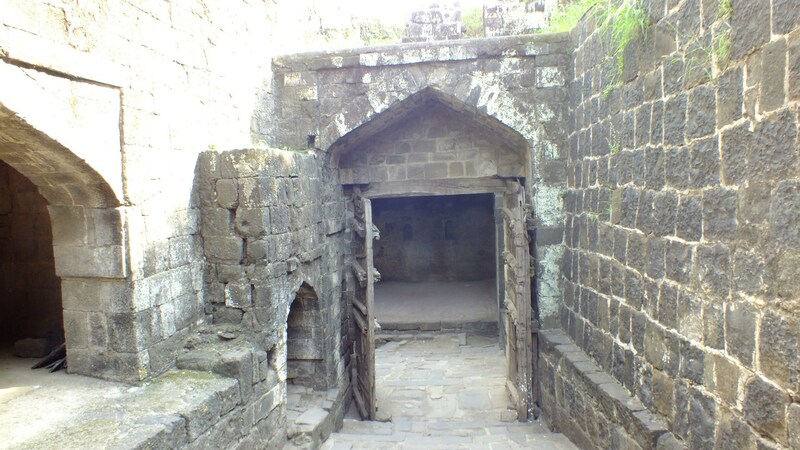 It is situated about 30 km from Aurangabad. 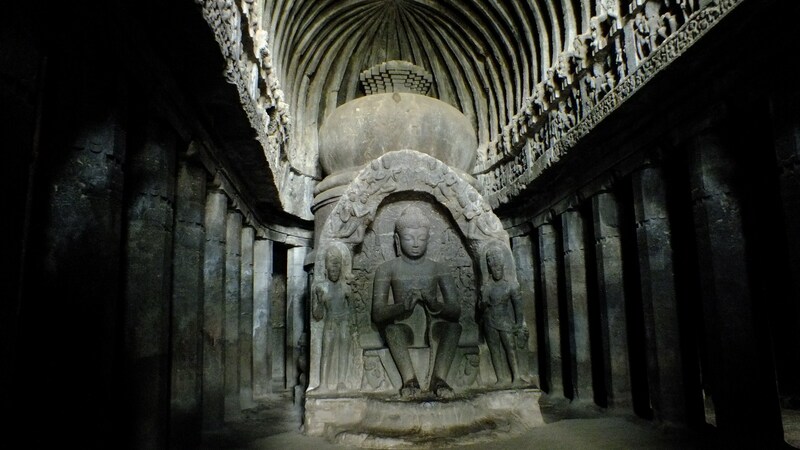 There are 34 caves in Ellora, starting with the Buddhist caves 1-12, followed by Hindu caves 13-29 and the Jain caves 30-34.The caves range from tiny one room unfinished caves to three storey Buddhist ‘monk hostels’ to the insanely huge and grand Kailash temple. At Ellora, bringing our own car turned out to be a blessing as the caves are spread out over more than a km and too far to cover by walking, especially under a very hot October sun. 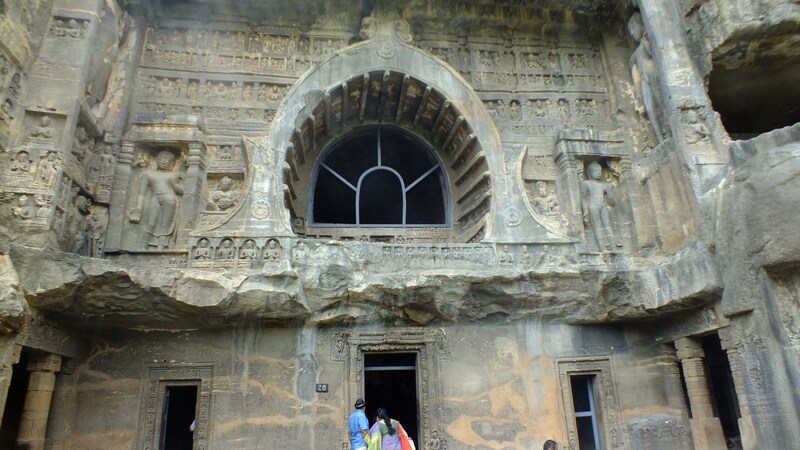 The main entrance – and the parking lot – is right across the biggest cave, cave number 16 or the Kailash Temple. For people without their own cars, they can hire autorickshaws from the parking lot to visit all the other major caves. We just drove our car to the caves. 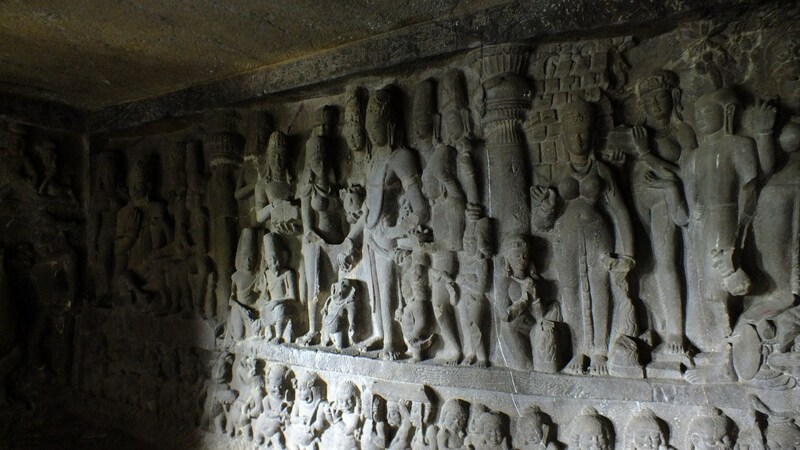 To do things in an order, its better to start with the Jain caves at one end (A very good source to look at the details of individual caves is www.elloracaves.org). 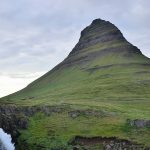 We didn’t know better, so we headed to the first cave we could find – cave number 29, also called Dhumar Lena. This cave overlooks a lake and pretty waterfall. Inside there are some carvings, most significant among them is a carving of Ravana trying to shake Mount Kailash. But this cave is mainly recommended for its view of the waterfall outside. Realizing the chronological order of the caves, we decided to head right to the end, the Jain caves, before tracing our way back to the parking lot. 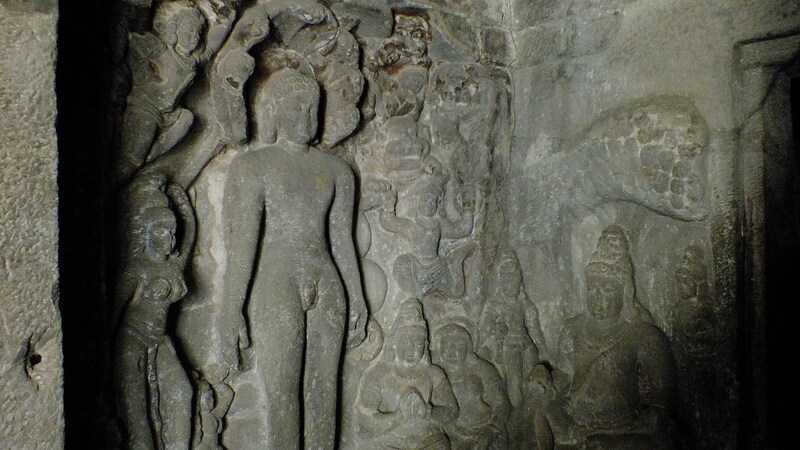 The Jain caves were the last ones to be carved out of the rock, in 800-1000 AD. 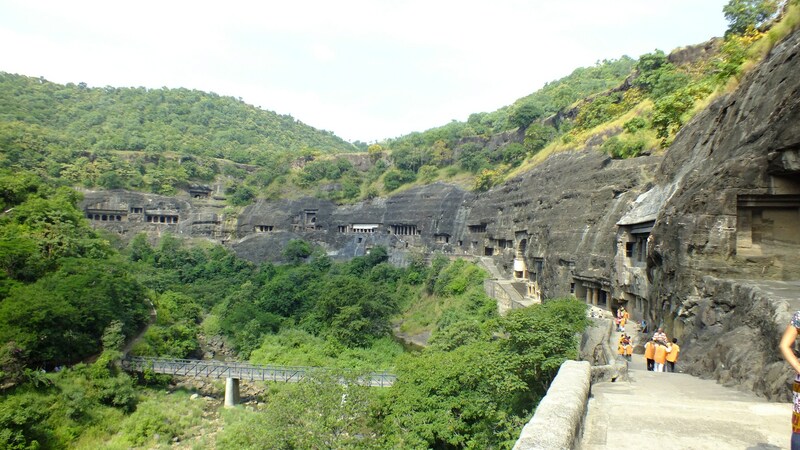 Among the Jain caves, the cave number 32 or Indra Sabha, is a must visit. Making up in finesse what it lacks in outright size, the Indra Sabha has a small temple in the middle of the courtyard and carved 2 storey halls on all three sides. Some very beautiful carvings of Jain tirthankars and yakshinis can be seen in the surrounding halls. There are also two monolithic elephants in the courtyard, out of which one has been patched up, while the other is in its eroded shape. The sun there was really strong in Oct too, resulting in us running back to the car and switching the car ac to full blast between two caves. We would park the car and sit in the car for a further 5 min cooling ourselves before venturing out for the next cave. Next was cave number 21, called the Rameshvaram cave. This cave is marked by a statue of Nandi outside the cave. The Rameshvaram cave is known for a full wall frieze of Shiv Parvati wedding – with numerous attendants in tow. It also has a big wall sculpture of the Saptamatrikas (seven mother goddesses) as well as a figure of Natraja. 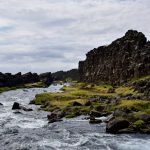 Having finished with the main caves on this side, we decided to go finish the caves on the other side of the Kailash temple so that we save the best for the last. For caves 1-15, unfortunately cars are not allowed, so we had to hike our way to the Buddhist caves. The Buddhist caves were the first among the caves, carved in 500-700 AD. Among them, the best is cave number 10, called the Vishwakarma cave. Cave number 12 and 13 are big three storey ‘monk hostels’ carved into the rockface Cave number 15, called the Dashavatar cave, is supposed to be a started as a Buddhist cave, but was converted midway into a hindu cave. 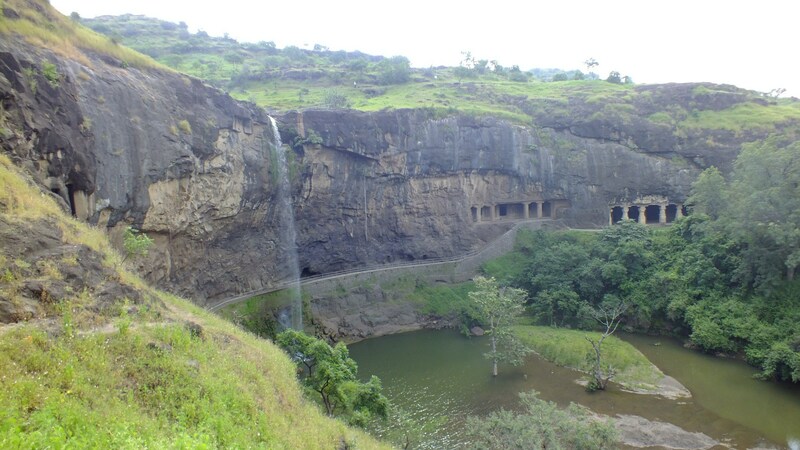 It has a square mandap dedicated to Nandi at the front and a huge hall on the second storey of the cave. The big pillared hall is decorated by big 8 ft high carvings of various Vishnu avatars as well as a few devas and a shivling. 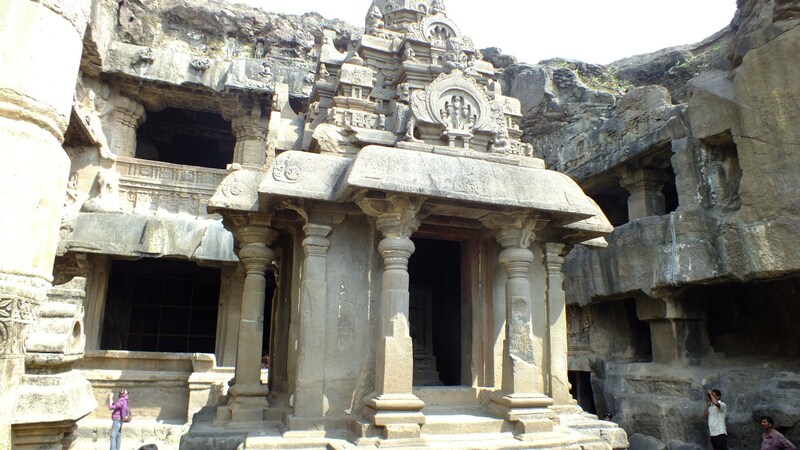 And finally it was the turn of cave number 16 or the Kailash Temple. When you enter inside the gate, the scale and splendour hits you in the face really hard – esp because you have seen the other caves already and compared to this one, the other caves seem like they were built by slackers ! Built by Krishna I of the Rashtrakuta dynasty, it took a 100 years to carve this temple out of solid rock. The carvers started carving from the top of the mountain, fashioning out the main temple as well as the elephants in the courtyard as well as the two stone pillars called Dhwajasthambas. All around the main temple is a courtyard, which is surrounded by pillared veranda on three sides carved with large beautiful deities. The main temple is solid rock, with a row of elephants carved at the bottom as if the entire gigantic temple was standing on the back of a herd of elephants. There is a single large room at its heart, which houses a lingam. The exteriors of the temple was originally painted in vivid colors, traces of which can still be seen. If you are the sort who tries to soak up all the details, you can spend hours just gazing over this magnificent piece of work. Even with looking over so many caves in Ellora, we were done by 1.30 pm. The road to Ellora passes the fort of Daulatabad. This is the same Daulatabad which was made the capital of India for a few years by the mad king Mohammed bin Tughlaq. He chose well, given the central location vis a vis the country as well as the impregnable nature of the fort. The fort is based around a natural conical hill, with concentric walls around the base of the hill. Since we were done early, we stopped at a highway dhaba for lunch and then decided to check out Daulatabad. However, the walking and climbing in the harsh afternoon sun dissuaded us from checking Daulatabad out thoroughly. We were exhausted by the time we reached the third gate – there was still the hill climb left. And returning tourists told us there wasn’t much up there. So we turned back to the comfortable confines of our car and drove back to the hotel. We noted a hoarding in the city about Mainland China opening in Aurangabad and we were stuck with a longing for crispy chilli corn. So we freshened up at the hotel and drove to a mall in the other end of the city in the evening (courtesy Zomato and Google Maps) – and had our fill of crispy chilli corn. Tuesday morning, we checked out of our lovely hotel and headed for Ajanta. Ajanta is a bit further away than Ellora – 106 km from Aurangabad. It took us almost 1.5 hours to cover the distance to Ajanta. At Ajanta, Maharashtra Tourism does not allow cars to come close to the actual caves. The parking lot is about 1.5 km away from the caves and there are buses to ferry passengers to and fro. The buses leave every 15 min, and we were there in time for the first bus at 9.15am. There is a little climb to be done once you get off the bus to reach the caves. The caves are carved midway into a U-shaped cliff – a gorge actually, with a small river flowing at the bottom. 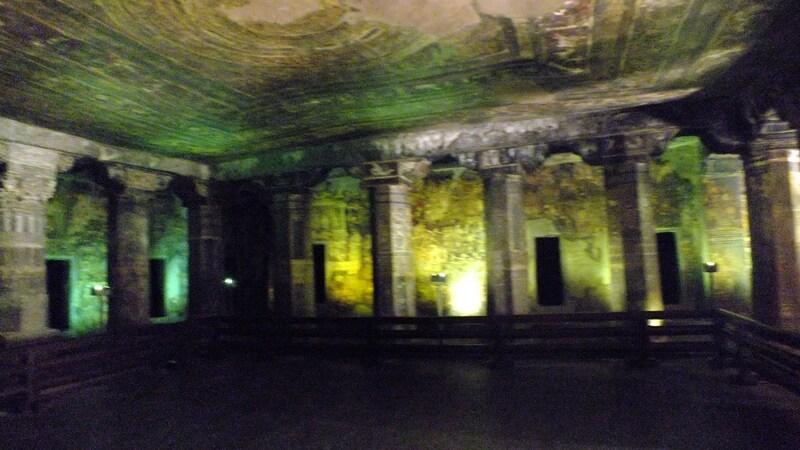 There are 30 caves at Ajanta and it is estimated they were carved/painted in 400-650 AD. The caves are a mixture of monasteries and living quarters for monks and their disciples. 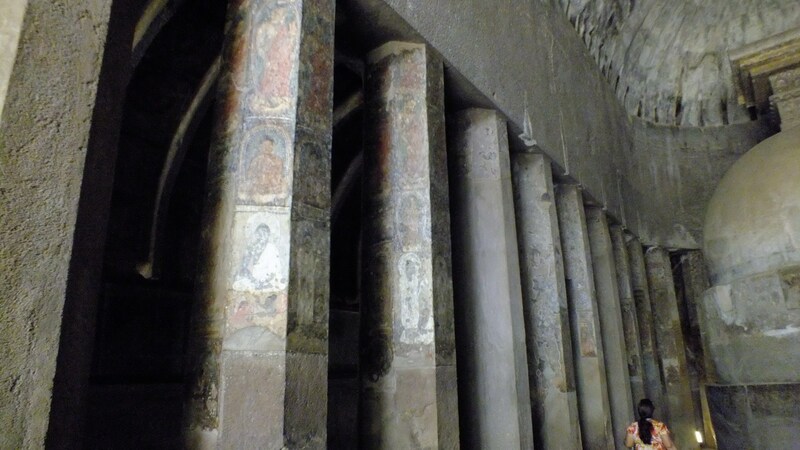 However, some of the caves are covered in exceptional frescoes – wall to wall and ceiling to ceiling. I honestly don’t know too many places in the world that have 1500 year old paintings of this finesse and size. It is a huge tragedy that most of these paintings have degraded badly over time. Because of the way these paintings were made – an inch thick layer of plaster on bare rock, followed by a thin layer of lime, over which the paintings were done – they are very susceptible to moisture. They are also susceptible to microbes and bright lights. Historically, these caves were abandoned within a few centuries of them being done and forgotten completely overtime. 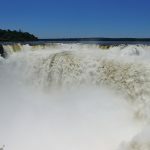 The natural moisture seeping into caves and microbes have caused certain portions of the plaster to fall off completely. Even in caves where relatively larger portions of the paintings have survived, they are significantly deteriorated. Interestingly, the caves were rediscovered by an Englishman out hunting for tigers in 1819. He proceeded to scratch his name and date on the wall of one of the caves, but because there was 5ft of debris in the cave then, his inscription is well beyond eye level for visitors today. Currently while all the caves are open to visitors today, there are strict rules imposed. No more than 40 persons at a time in any cave at a time. Strictly no flash lights while photographing. The lights used inside are minimalist LED lights. It’s a struggle to make out details (or take good photographs) inside. It is highly recommended you carry a good torch with yourself when visiting Ajanta . Guides have torches with them, so it’s a good idea to hire a guide. The 4 caves which have the best painting are caves 1,2, 16 and 17. 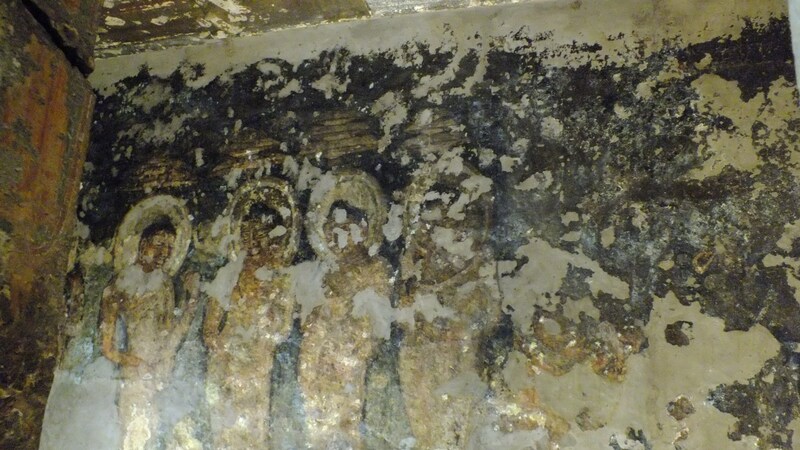 Infact Maharashtra govt announced plans to create real life replicas of these caves for visitors and close the original caves to avoid further degradation to the paintings. The subject of paintings are the Buddha and stories from the Jatakas. The most famous symbol of the Ajanta caves – the Bodhisatva Padmapani – is in cave number 1. However we felt cave number 16 was the most phenomenal of the cave paintings. The paintings are the most preserved here – you get a full idea of how fabulous the caves would be when you stand in one corner of the room and gaze across the square room with paintings covering every inch of space except the floor. Apart from the abovementioned 4 caves, there are a few other caves which have some paintings – like cave number 6, which has a beautiful depiction of Buddha seated surrounded by attendants. Cave number 9 is a vihara with a pillared gallery all around. All the pillars have been painted from top to bottom. Apart from the paintings, a couple of caves in Ajanta focus on traditional carving instead. Notable among them are the Cave 19 and Cave 26. Both have very imposing double-storey doorways. 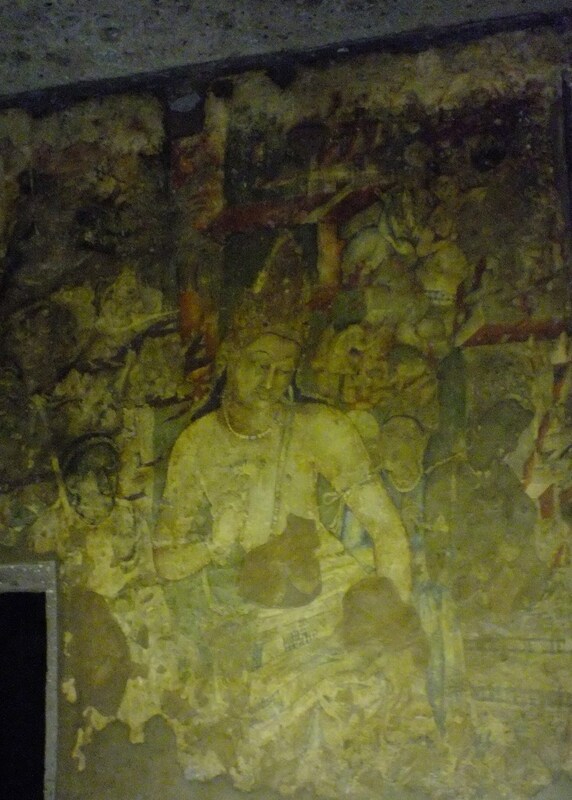 Cave 19 also has paintings in the pillared gallery around the main vihara as well as the roof. Cave 26 has the best sculpture – the entire cave is filled with beautiful sculptures, including a 7m long statue of a sleeping Buddha. The total distance to walk is about a km each way – entrance is only from the side of Cave number 1. We were done by 1pm and we decided to have our lunch break at the MTDC restaurant in Ajanta itself. The food was simple thali based – nothing exceptional – except that they served chilled beers and cold drinks. We stuck to cold drinks since we had a long drive ahead. 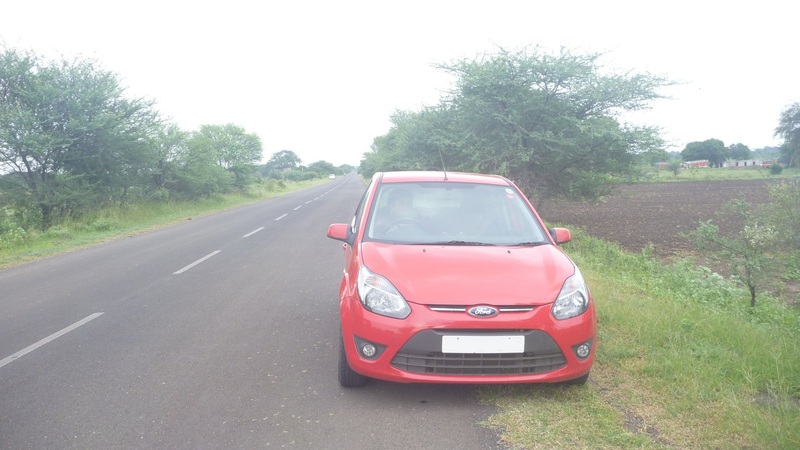 We started on our way back at 2pm and the plan was to drive directly to Mumbai – 465 km, with adequate breaks in between. However, the day started darkening even at 4pm when we started on the Shirdi-Aurangabad bad stretch. When we crossed Sinnar and started on the Ghoti-Sinnar road, it was just 6pm but it was already dark and overcast. We took about 1.5 hours to cross this road and touched the NH3 at Ghoti at about 8.30 pm. In between we were looking for a good dhaba to stop and have a cup of tea, but on those smaller roads, none of the dhabas were nice enough. We thought we would stop at Igatpuri where we were sure to find some good place for a break. The 1-hr drive down NH3 was very rejuvenating – and the feeling was that we could do the remaining 2 hours to Mumbai easily too. As it turned out, because of Gandhi Jayanti, roads were emptier than usual and we took just 1.30 hours to reach Mumbai. Great post. Very interesting information on Ajanta and Ellora caves with beautiful photos. Please look into my Heritage of India blog. 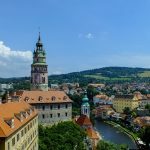 Please share your opinion about my blog. 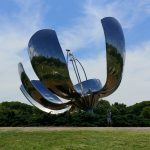 Shall i use your images in my blog.